You are here: Home / Ethnic Groups / The People of Sulawesi / Who are the Lolak? The Lolak are an agrarian people who have always lived on the fringes of more powerful neighboring groups. They live in the Lolak district in North Sulawesi province. Eighty percent of the Lolak population live in this area and are divided among three villages of Lolak, Mongkoinit and Motabang. 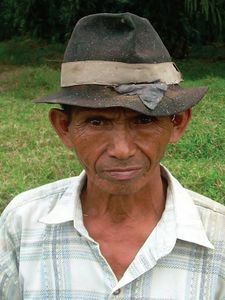 The chief characteristic that distinguishes the Lolak from other native Mongondow groups is their language, which is structurally similar to Gorontalo. Despite this similarity, the Lolak language has heavily borrowed from the neighboring Mongondow language. In fact, the Lolak homeland is surrounded by the Mongondow people, and Mongondow is the second language of most Lolak. The Lolak area is fertile with long black sand beaches, flat grassy fields, coconut plantations and rugged inland mountains. The Lolak are farmers who grow rice, coconuts, corn, and cacao. They also raise cattle. Large areas belong to rich absentee landowners worked by area residents. Rice and sago are food staples. Some Lolak also hunt deer. Housing is basic and in some places very poor. When a Lolak family becomes wealthy enough, they replace their thatch roof with tin. The wealthiest Lolak also buy satellite dishes. Access to fresh water is not a problem since many families have wells. The main village of Lolak has its own small hospital. Although the area has typhoid, there is very little malaria. The district has 20 elementary schools and most Lolak children are able to attend. Further education requires relocation. Those able to attend high school typically study in Kotamobagu or Manado. Of the few who seek further education, most study farming, husbandry (livestock breeding), economics, or law at Sam Ratulangi University in Manado. Lolak genealogy is bilateral (traced through both parents). Inheritance is handled in the same way for both male and female descendants. Male family members receive no special treatment. They typically marry before 20 years of age and have more than two children per family. The Lolak are Sunni Muslim. The village of Lolak itself has three mosques. The Lolak typically marry with neighboring Bolaang-Mongondow, Gorontalo and Bugis Muslims. They interweave traditional beliefs with Islamic teaching and regard this as a positive influence for their hope of paradise. Economic development is very difficult to achieve. Opening new fields of employment is one of greatest needs of the Lolak. A Lolak person who graduates from University often finds it hard to be gainfully employed in their field of study, so they often return to farming. Many young people move to Manado, Makassar and even Jakarta in search of work.